Eboni began her journey into the arts at the age of 4. As a native New Yorker she has trained extensively in jazz and hip hop while also studying ballet, tap, modern and West African dance. She began her professional performing career at Frank Hatchett's Professional Children's Program at Broadway Dance Center in New York City. She then had the honor of studying under and assisting the legendary jazz dancer Frank Hatchett in various dance projects, as well as becoming part of his VOP team. Eboni took her first hip hop class when hip hop was just being introduced into dance studios under the direction of Robin Dunn. 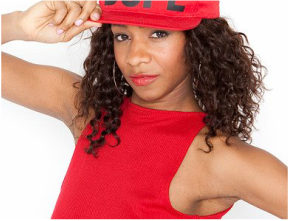 Eboni has choreographed, traveled and performed for various artists, networks and brands. When not performing, she is a dance instructor of over nine years at dance studios, afterschool programs and conventions with students of all ages and ability levels. As a teacher, she thrives off of the energy and passion her students have to offer. Eboni encourages her students to grow and find a love for dance through their own personal exploration. Her goal as a teacher is to inspire and empower all through the performing art of dance. Eboni has worked with Grammy Award Winner Ludacris, Mariah Carey, Mary J Blige, Sean Paul, Lil Mama, Missy Elliott, R&B artist Jaheim, and Disturbing the Peace, to name a few. Some of her performance credits also include MTV's "Video Music Awards" and the NHL's New Jersey Devils Entertainment Team. In 2012 Eboni developed her own program, E.L. Dance NYC, created to inspire and instill the fundamentals of dance - technique, creativity, coordination, self-esteem, musicality and fun - in children. Currently, you can find Eboni in NYC teaching West African, Ballet, Jazz and/or Hip Hop dance at the School at Steps, Steps on Broadway, Ballet Hispanico, Alvin Ailey, PS 6, PS 212, The Dalton School, and now The Neighborhood Playhouse Junior School!